The PREFORMA project run a webinar series throughout September to present the three conformance checkers that are being developed for electronic documents, still images and audiovisual files. 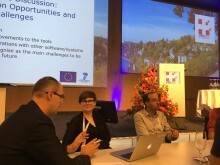 The webinars introduced the PREFORMA project, updated participants on the current status of the conformance checkers, demonstrated the software, outlined future plans, and gave examples of how the community can contribute, or provide feedback. The next appointment for all those who are interested to meet the PREFORMA team and the suppliers and see the demos live is the the PREFORMA Experience Workshop, which will be held at Kulturforum in Berlin on 23 November 2016. Register here to share your experiences, meet the PREFORMA developers and learn more about our tools!